Powerscreen, a Terex brand, is one of the top manufacturers of trommel equipment, serving the aggregate industry since the 1960s. They offer a broad range of mobile Powerscreen trommel machines suited for a wide variety of applications, such as mining, quarrying, demolition and recycling. Powerscreen produces a wide array of trommel machines with innovative features and benefits. To find out how we can provide a custom solution for your Powerscreen trommel machine today, simply call us at (888) 344-3653 and we will be happy to assist you with your replacement trommel drum screen needs. 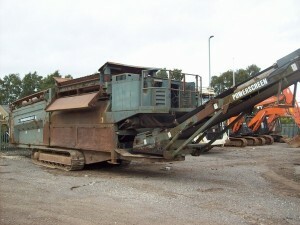 Samscreen is pleased to provide complete trommel replacement units, the ideal solution to your replacement screen needs. We offer trommel replacement units for virtually every application, and for the industry’s leading brands of trommel equipment. If you need a trommel screen replacement for your heavy-duty screening application, Samscreen can provide you with an economical solution. Samscreen can wrap your existing trommel drum unit with our exclusive Maxwear™ punch plate.